We're pretty excited to have been asked to write this monthly food column for Hibiscus Matters newspaper. Below is a link where you can keep up with each issue. North Auckland's Mary Brons thought someone was playing a joke on her when she was asked if her jam could be included in a personalised hamper for the Queen. Brons, from Red Beach, has been making jam for five years and never once thought her product could be in the hands of the Queen one day. Last month she was approached by the owner of Karaka's Paddock to Pantry who spotted her NoShortcuts feijoa and ginger jam in Farro. "I thought someone was playing a joke on me at first but it turned out the Kiwiana hamper was going to contain a variety of New Zealand products and was going to be sent to the Queen during a visit from Prime Minister, Jacinda Ardern." 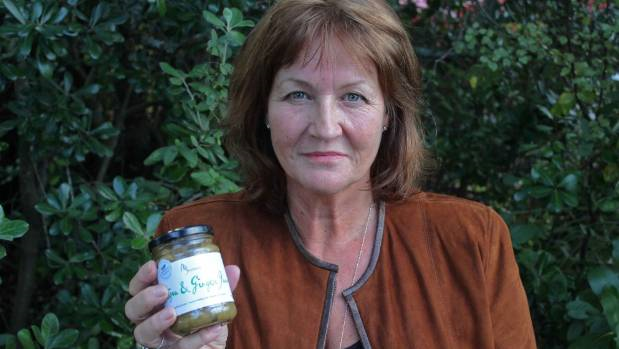 Brons said her feijoa jam was one of many products in her range but was more Kiwiana. "Feijoas are typical New Zealand so the jam was perfect. I love feijoas and this is the first recipe I have made that still has the feijoa taste after cooking it. "It tastes great on blue cheese and pork," she said. Brons said she was working in the corporate world before starting her business. "I had an unexpected change and someone said why don't you give business a go. I had been making jams, chutneys, relish and pickles for years at home for the kids and would sometimes make them for friends and it got to the point where people were asking to buy them. "I decided to run with the idea and started selling them at the farmers market and it went off from there. 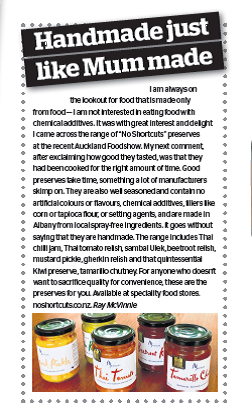 This particular product was a recipe from a friend and became a finalist in the New Zealand Food Awards last year." Brons has won three awards for her products in the past few years. "I also won a highly commended and acknowledgements from the judges at the New Zealand Farmers Awards. I plan to enter more awards"
Thank you Ray McVinnie for this great article published in Bite magazine August 2017 issue.